Being conscious of the importance of marks secured by pupils in the Public/Board Examinations, the School places it on the top of its agenda. All possible efforts are made to ensure that its pupils perform to the best of their abilities in the Board Examinations (I.C.S.E. and I.S.C.) 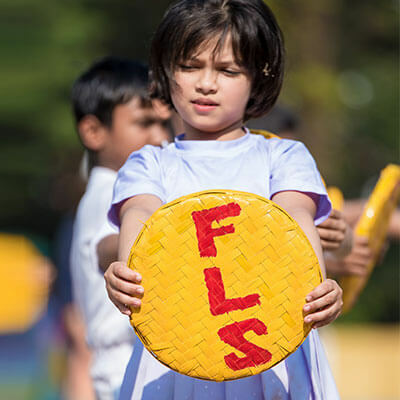 and FLS boasts of a brilliant track record in this regard. The School has a distinction of producing 100% pass results from its first batch of candidates with high percentage of marks and even the lowest score being above 70%. The School has a record of attaining a class average above 80% every year. In order to maintain the high standard of board results the School takes special initiative to arrange Board Exam related workshops which are conducted by highly reputed academicians and exam paper setters. The pupils, after graduating from the School, are admitted to leading schools & colleges of repute and are highly praised for their academic interest, discipline, moral values and proficiency in various activities and have been very highly placed in their professional lives as well.